The direction of market movement can change rapidly, at an uncertain time. A trader must be ready to face every possible movement. I am no exception. That is why in each trading journal, I share the strategies resulting from learning, analysis, and personal experience. LEARN TO What is the Meaning of Spreads and Their Effects in Forex Trading? Choose instruments with small body candle charts and meetings, meaning that the price range in this condition is very stable and continues to follow the trend. Choose instruments with low volatility. This is to avoid price movements that are too far, even though basically it's free to choose any instrument. However, make sure the number one requirement is fulfilled. 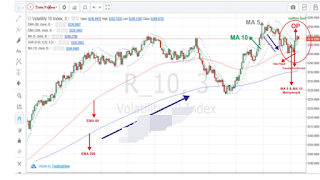 Use the Moving Average Exponencial / EMA indicator with input length 80 and input length 200 to find out the dominant trend that occurs. This indicator line also functions as a support and resistance limit. The principle of this indicator also indicates a change in the dominant trend if the two indicator lines intersect. If the EMA 200 line is below the EMA 80 line, the dominant uptrend occurs. Conversely, if the EMA 200 line is above EMA 80, the dominant downtrend occurs. Select the Parabolic SAR indicator or often called PSAR. When the PSAR indicator is above the candle chart, it means there is a downtrend, and vice versa. When the PSAR indicator is below the candle chart, there is an uptrend. 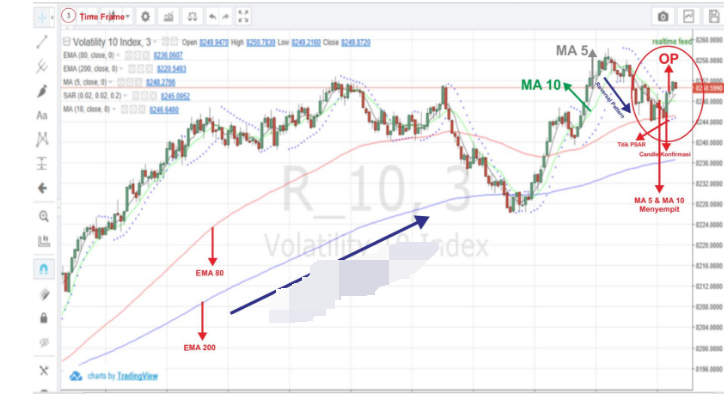 Besides the two indicators, we also use the Moving Average or MA indicator, with input length 5 and 10. This indicator is used to read the occurrence of small trend changes. If the 10 MA line is below the MA 5 line, a small upward trend occurs. Conversely, if the 10 MA line is above the MA 5, a small trend occurs down. The duration of trading is twice the time frame period. It must be preceded by a reversal of the pattern until the rebound of the candle touches the price level support 80 EMA. MA 5 and MA 10 must begin to narrow but do not have to intersect. There must be one candle up (green) as a confirmation candle. The indicator point of the Parabolic SAR is already below the candle before a new candle is formed after the confirmation candle ends. This is because the PSAR indicator is leading. 0 Response to "Best Trading Moments in Dominant Trends"